Daughter of US President Donald Trump and Donald's second wife, Marla Maples. She was raised in California by her single mother, and attended the Viewpoint School in Calabasas. She chose to attend the University of Pennsylvania, her father's alma mater. 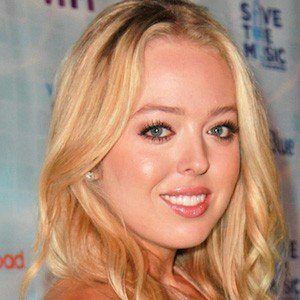 She has four half-siblings on her father's side: Ivanka Trump, Donald Trump Jr, Barron Trump, and Eric Trump. Her father entered the 2016 presidential campaign as a Republican candidate, running against politicians such as Ted Cruz and Chris Christie.